Single digit and sub-zero temperatures . . . sorry, but I'm not going camping! And this photo was before the weather got worse! The wind is blowing outside, and the snow is drifting. I've just re-shoveled the trench from our house to our garage. Then I chopped more wood for our woodstove--I was going to work out on the elliptical but wanted to engage in more useful activity (besides getting healthy) and chopping wood it was. Fresh air, chill wind, and icy snow gritting the eyes. Ah, winter! Then the weather worsened, and it wasn't just cold--it was damn cold! More snow that didn't leave, drifting and a couple of mornings of significant shoveling. I stand by my window, looking at the camper wrapped up outside. Beside me the woodstove is radiating warmth. Patience, Tom! Twenty below zero, Fahrenheit, today, January 30, 2019. I'm not calling this a bell-ringer day, but it is a day I've prepared for. I've chopped a lot of wood, stocked up the refrigerator, steeped a cup of chai, and plan to spend the day inside. It will warm up today, of course, to a high of -9 degrees, F. I keep reminding myself that in the humid dog days of August, I will remember this frigid, icebox winter fondly. Hmmm . . . Well, maybe not fondly . . . 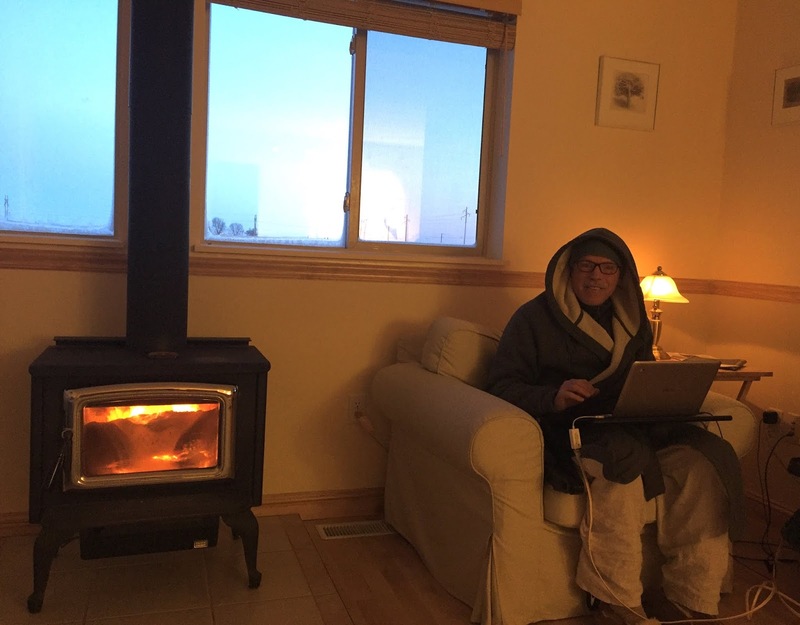 I'm comfortable, and it's weather like this that justifies my wife and I having our woodstove installed. If the energy goes offline, then we have the back-up. (And a house party with all of our neighbors visiting!) If not, then we have the comfortable heat that we've enjoyed for over ten winters. A win-win situation! Meanwhile, the Green Goddess is in hibernation, and I am happily researching and writing, warm beside the fire. At dawn, negative 20, but warm! 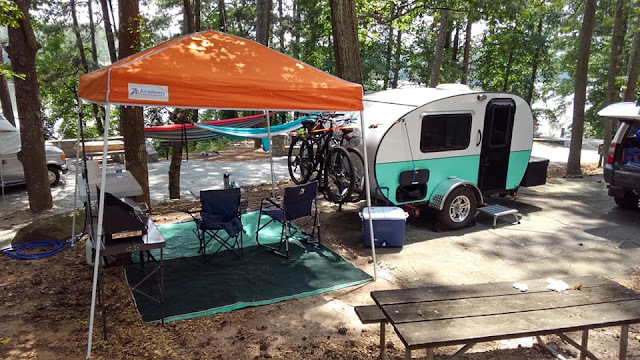 Judging from the photos posted on social media, tiny trailer owners Lee and Lori Gandy have many opportunities to camp in beautiful spots in South Carolina . . . and they are taking full advantage of those opportunities. These two happy campers have owned their Rustic Trail Teardrop Camper for one and a half years. It's a Grizzly model, a bit taller than the Papa Bear teardrop, yet still short enough to fit into a garage. Fortunately for us, the Gandys enjoy framing evocative photographs of the pleasures of kicking back at a beautiful campsite and enjoying the moment. To quote Lee: "I. Love. Camping." 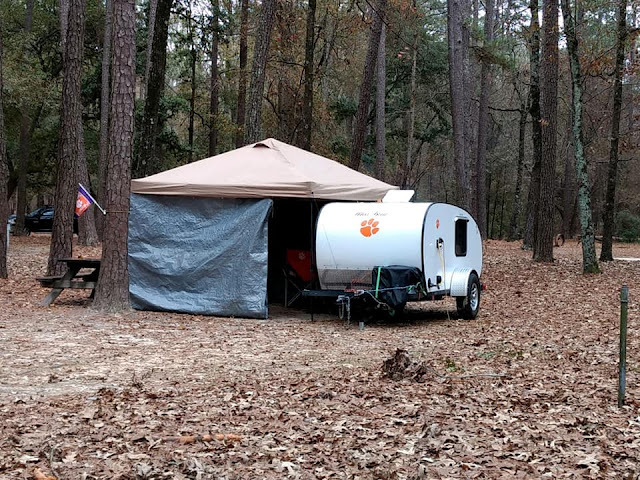 In the year and a half that they have owned their Grizzly, Lee and Lori have camped "about 14 times, about ninety percent of our camping in South Carolina state parks (there are 46 of them!)" Towing their Grizzly to some idyllic location has never been a problem for the Gandys. They now own a 2013 Toyota Highlander Limited, but "started towing with a 2001 Nissan Xterra but upgraded to a more comfortable vehicle. Both of these vehicles have a 5,000 pound towing capacity. Both vehicles tow the teardrop with ease. I did not add brakes to the camper and it has never been an issue." The tow package: "I'm thrilled with how the Highlander tows, btw." Although the Gandys have owner their RTTC Grizzly only a year and a half, they are not new to camping. "We loved the idea of tent camping and did some tent camping, but because of weather issues, humidity, and the lack of sleeping well with tent camping, we did very little." They thought that one "tiny" change would make a difference, and it did! "We chose a teardrop because we basically wanted an 'air conditioned tent on wheels' so we can camp on any given weekend without a lot of prep time. We also knew that if we had to store a camper somewhere, the inconvenience of going to get it and prep it before camping would hinder us from using it, especially for short trips. The teardrop fits in our garage where it is sheltered from the elements. We can literally decide to go camping one moment, and leave the house with the teardrop in tow within 30 minutes. We like the outdoor benefits of camping, so we basically only need a comfortable place to sleep as we spend most of our time outside while camping." 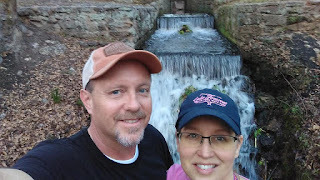 And the time Lee and Lori spent outdoors while camping is an inspiration: hiking, bicycling, kayaking--they are definitely "on-the-go" campers. 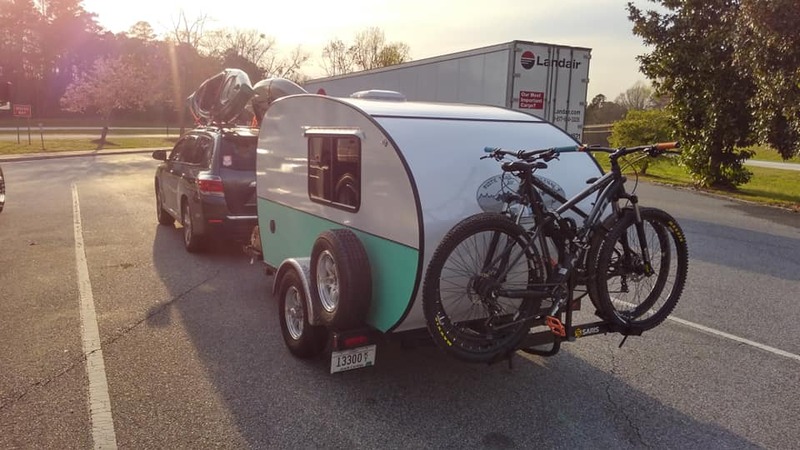 Tiny trailer, bikes, kayaks--bring it on! The Gandys have created an effective blend of activity and rest for their camping pleasure. 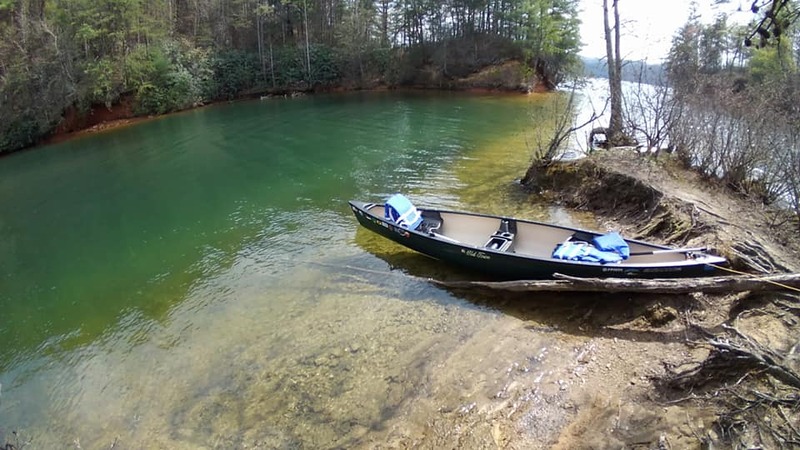 "When we camp, we look for places that have two things available: a river, lake, or really any body of water that we can canoe, and trails for our mountain bikes. We also purposefully find sites where we can set up our hammocks. 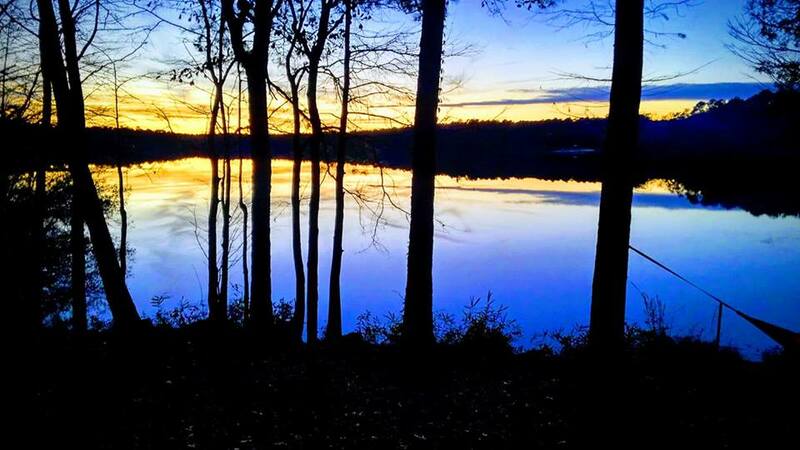 We favor the mountains, but really anywhere that has woods and a body of water is great with us." And their favorite time of year to camp? "Hands down, we do most of our camping in the late fall through early spring time of the year. We like the cooler weather, lack of bugs and snakes, and less crowded conditions at the parks. 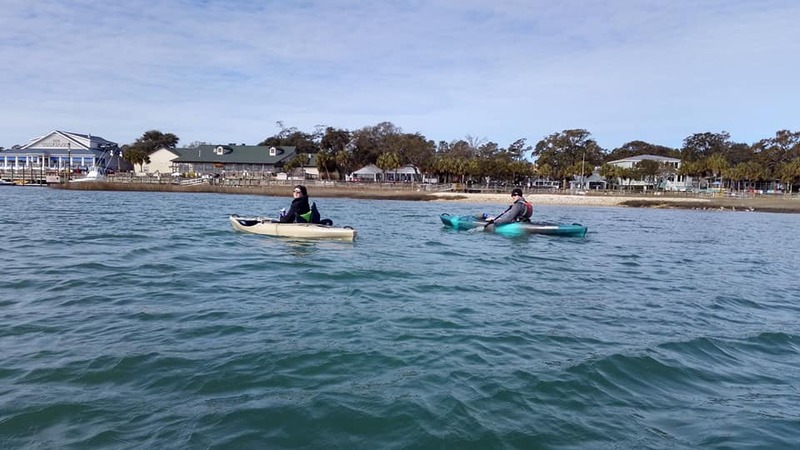 We are both teachers so we love to camp during the Thanksgiving break, and usually twice during the Christmas break." Their ability to put together a great camping experience is not lost on others. Their best experiences "are the looks we get as we drive through towns...we see people pointing out our camper to others...people stop us to say something about our camper...strangers wanting to know about it, see inside it, etc. We love that." It looks like the Gandys have "getting away from it all" down to a science. Their camping experiences have resulted in some changes to Lee and Lori's rig and equipment. 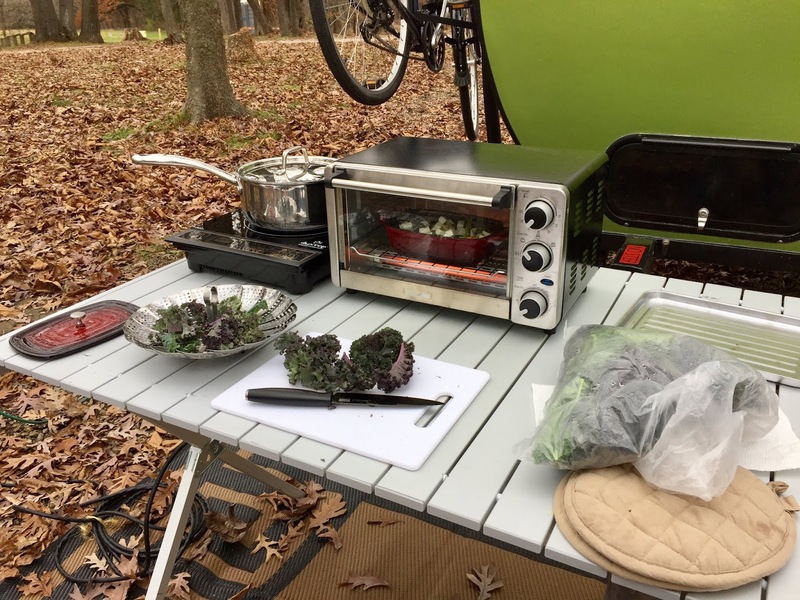 "We added a mini-fridge and a small microwave to the inside of our camper. This allows us to keep our food items in the fridge after we get set up. We keep our drinks in a cooler outside. We added a diamond plate aluminum toolbox to the tongue of the camper so that we can store the 'outside' equipment in it (wheel chocks, water hose, extension cords, etc.) I do not have a 'chuck box' as I prefer to be able to set my kitchen up wherever it's most convenient at any given campsite. We use a tailgate tent to set up in front of the camper. One of our favorite camping accessories is the 'Lil Red Campfire' (propane campfire in a can). We love building real fires, but this makes it easy to have instant heat for cold/wet mornings. I replaced the fake logs with black lava rock which makes for a beautiful flame." No wonder the Gandys enjoy camping. They have a rig they really like, they've added useful modifications to it, and they've included enough extras to make their stay outdoors a fun and relaxing experience. Based on their experience, their advice to new campers is to "practice at home before you take the camper out. Set it up, level it, sleep in it. This will give you confidence when you take it out the first time. Make a checklist of everything you need so that you don't forget anything. Go watch a million YouTube videos about tiny trailer camping!" Although they are both busy schoolteachers, the Gandys still have plans to take out their rig and get away. They are planning their first extended road trip for the summer of 2019. "We plan on driving the entire I-77 corridor from SC to Lake Erie in Ohio. 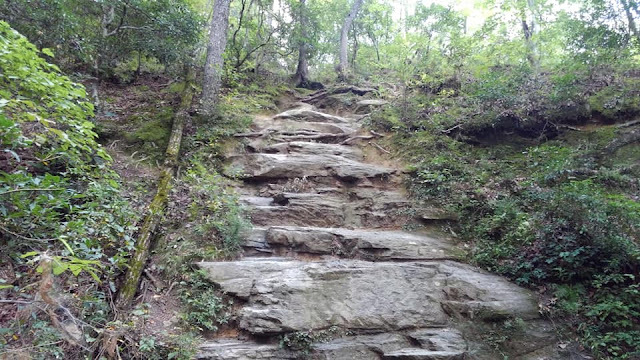 We will camp in the mountains of Virginia and stay at a state park on the Great Lakes...then head to Michigan. We will have one night in a hotel just to get "reset" (do laundry, restock, etc.) Our big dream is to drive out West (Grand Canyon, Yellowstone, and up to Oregon) one summer. With their great tow vehicle and trailer, and with all the fine-tuned, choice camping equipment packed away, we're sure the Gandys will have great fun on their grand adventures. 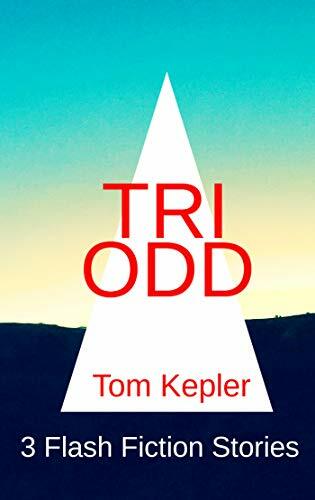 Keep your eyes peeled for a little turquoise and white teardrop, and if you see them, be sure to give a friendly wave, for without a doubt, you'll get one back! 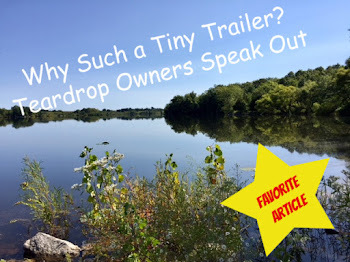 Why Choose a Teardrop or Tiny Trailer? Why or how to camp in a teardrop or tiny trailer was a recurring writing theme for Green Goddess Glamping in 2018. And that's not surprising because owners of small campers have a specific view of what constitutes an enjoyable camping experience, a view that is a balance of simplicity and comfort, ease and elegance. The more I write about minimalist camping, the more I realize my somewhat intuitive choice of Green Goddess Glamping for this blog's name was actually insightful and accurate. 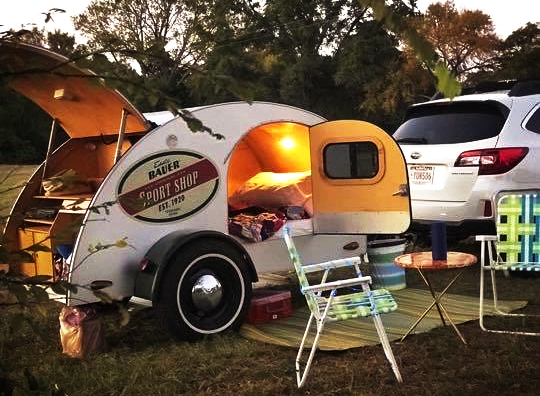 For most teardrop or tiny trailer campers, the little rig is a step up from tent camping. Most are seeking a safe haven for sleeping and getting out of extreme weather conditions. 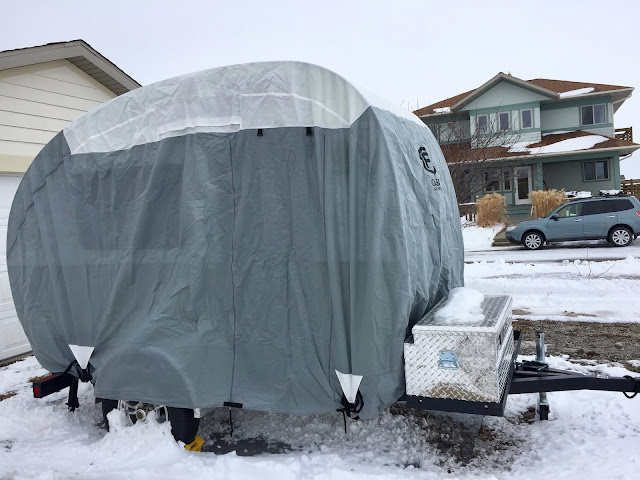 On the other hand, most minimalist trailer campers what to structure their camping experience to include a closer connection with the outdoors, to blend the inside/outside living space rather than sharply defining it. Cooking outside but having the option of cooking an inside lunch if a rainstorm is passing over is one characteristic of tiny trailer camping. Having a portable heater inside the camper yet spending quality time sitting by the campfire is another quality tiny camping experience. Having a soft, home-style bed in the camper yet trotting outside at night with the stars wheeling overhead to visit the utility tent and the portable toilet is another tiny camping experience. Inconvenient? Perhaps, but so many minimalist trailer campers comment on the beauty of the sky at night and the deep, rich earth smells, something we don't normally experience at home in the middle of the night when we get up to take a leak. Three articles I wrote during 2018 speak (at least for me) about the unique blend of luxury and nature that small camper sojourns provide: in other words, down-home glamping. One article researched why teardrop and tiny trailer owners chose their camping style, another article defines "glamping" in terms of small trailer camping, and the third article discusses the camping experience in the light of quality rather than quantity. Looking at these three articles as a group pretty well defines the tiny trailer camping experience. Each title is linked to the original if you'd like to see more photos and read the full article. After I had bought my tiny trailer or "tall" teardrop, I wondered if my reasons matched others, so I went to social media and asked owners why they camped tiny. The over-riding reasons for choosing small were cost, comfort, simplicity, and lifestyle. One owner mentions the comfort of owning "a bed on wheels," and another owner, who tells the experience of almost being trampled by a herd of cows when tent camping, cites that extra little safety of being able to get inside. "Small needs, small space" is how, with few words, one tiny camper explained the experience. I've read articles about glamping that include a resort experience of fine dining and appointments for after-hike massages. Nothing wrong with that, but my wife and my experience of glamping at the local county park is somewhat more modest. 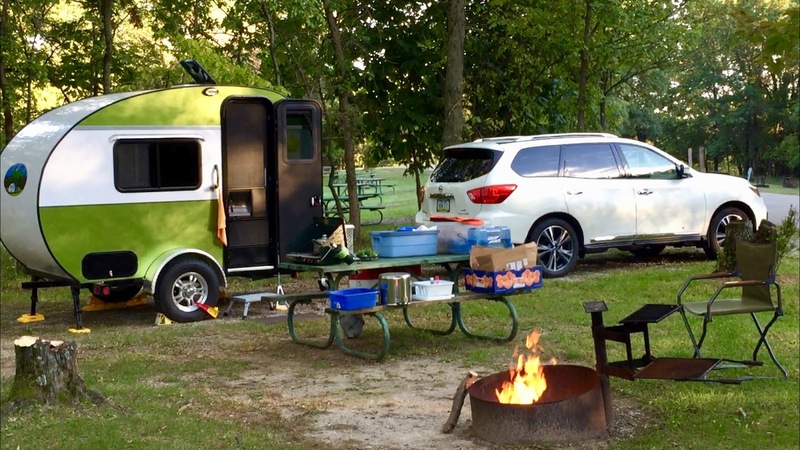 Exploring this concept led me to other articles about glamping and a final list of how choosing a tiny trailer over a tent or an RV apartment has improved my camping experience. These seven qualities are included: cozy bedding, touches of home, some form of electricity or light, increased comfort of living space, good food and ease of cooking, "stations" for camp chores, and enriched entertainment options unique to the environment. My article uses REI's definition of glamping of a spectrum of glamour from "uber-luxe" to "cozy." Within that spectrum, I definitely find my niche. I really liked thinking about and writing this article, which is about visiting one campsite more than once and finding a deeper appreciation of a particular place. 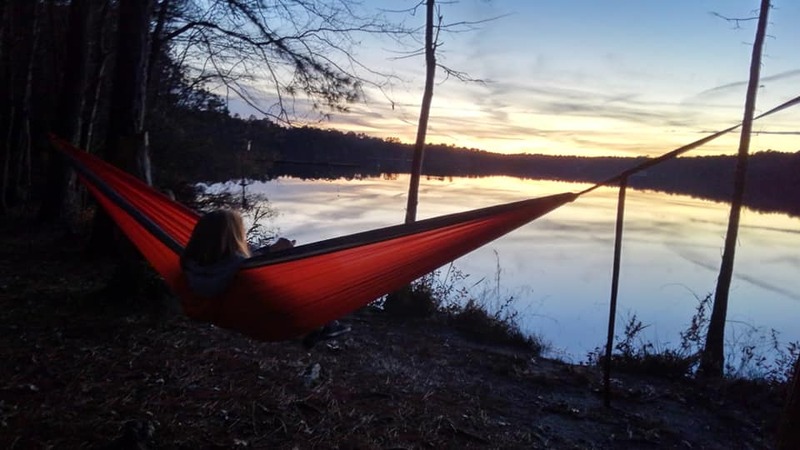 The article explores how a familiar camping location can be more relaxing and how a more thorough experience of a place deepens our connection to nature; again, the theme is one of quality over quantity. 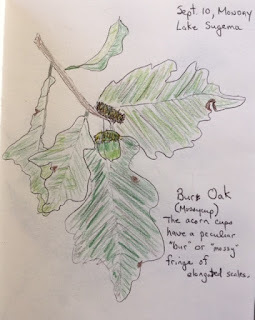 I find real pleasure in discovering new hiking trails at a campground I return to, find the joy of tree identification and slowing down and cooking better meals. "Where do we want to camp this weekend?" doesn't have to be a new place. It can be our old friend just down the road. For myself, writing this blog is a way of deepening my appreciation of my experience of tiny trailer camping. I've tent camped, bicycle camped (and still do), and I've done the travel experience of staying in a motel. Each has its utility and charm, but I do have to say that spending time outdoors with my wife, not having to make a huge investment in an RV and then have to transport it, and adopting Henry David Thoreau's creed of simplicity is deeply satisfying. 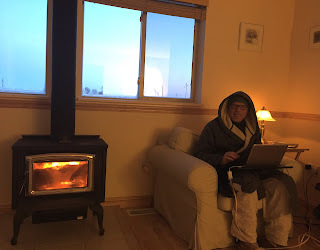 As I write this, I'm sitting in my home next to my woodstove. It's January, and the temperatures will be in the teens for as long as the weather forecast is willing to predict. I am so eager for warmer weather and my next camping experience. Funnily enough, though, my wife and my choosing the simple path as campers has also led us to enjoy simplicity outside of camping. I guess what I'm trying to say is that sitting at dawn in my cozy house, next to the warmth of the woodstove, the beauty of a snowy field out my north window, the grays of fog and first light--well, maybe "camping" isn't so much a place but a state of mind. Labels: Glamping, Why a Tiny Trailer? 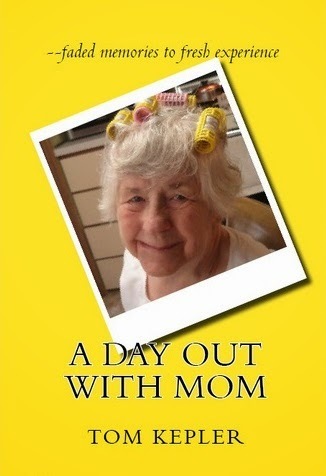 It was a hot summer weekend over fifteen years ago, and I was busy taking care of my disabled wife and catching up on the weekend chores. The air conditioner was running, as were the dishwasher, washer, and television. I had fresh bread baking in the oven. Heading down the stairs to the old basement of our eighty-year-old home, I smelled an electrical burning odor, and checking the fuse box, I saw the old style fuses glowing with heat. I had overloaded the circuits and was close to catching the house on fire. Why hadn't I considered that the old wiring and fuse box were not set up for modern appliance loads? Why hadn't I asked myself how many watts that big window AC unit pulled? I switched off all the appliances except the oven. I had saved the house yet realized I had to contact an electrician to modernize our central electrical system. My attention had been on weekend chores, and I'd just never considered the realities of overloading the house's electrical system. Naive and dangerous. We certainly don't want to overload our tiny trailers' systems when we are out for a fun weekend at a local campground. Doing some simple math (as in addition) can save us the misery and stress of putting out a fire in our trailer or on our cooking table. My tiny trailer is an RTTC Polar Bear. The central connect from the trailer to anything plugged in is an Utilitech 4-junction box and cord, rated for 20 amps. The system has built-in overload protection. At 120 volts the 20 amp system equals 2,400 watts. You can only load up to 80% of the capacity, so we're talking not plugging in more than 1,920 watts. However, the top power strip is rated at 1,800 watts, of which 80% equals 1,440 watts. Therefore, I don't plug in appliances that will pull more than 1,920 watts into the lower power strip. We also have to consider the extension cord that runs from the campground electrical mast to the camper. What is its capacity? My current cord is rated for 1875 watts. 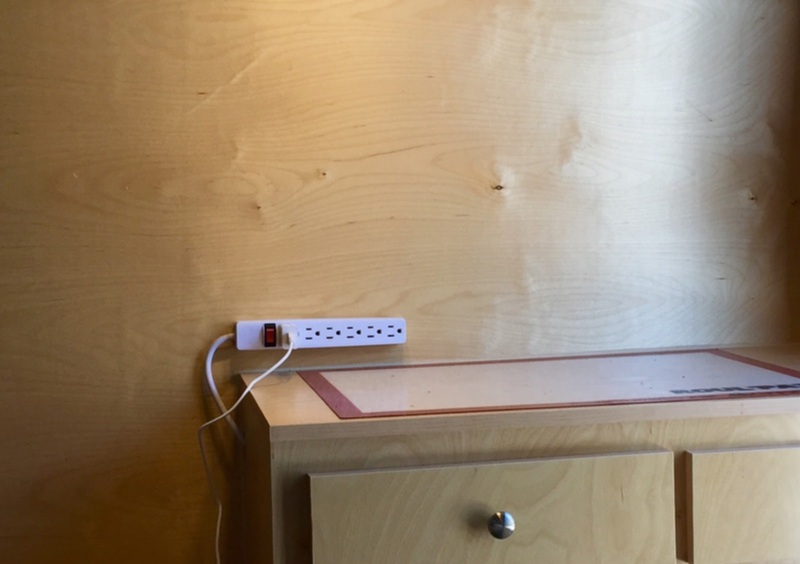 Finally, this winter I've unplugged the air conditioner at the Utilitech outlet box, giving me another plug-in to use at that primary interface, rather than using the outlet strip that is above the cabinet (and piggy-backed into the primary junction). Just a bit of simple math reveals how living in my tiny trailer entails, mostly, not running any two appliances at once. The numbers explain why I once tripped the camper's circuit breaker when I had the heater on the second setting (900 watts) and turned on the teapot. 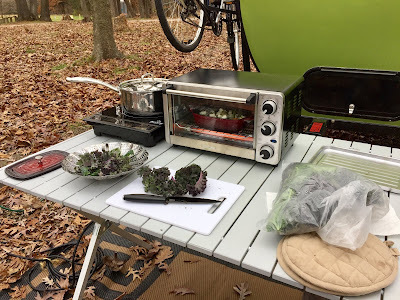 It also explains why when I was cooking outside once (using a second circuit from the campground mast), my extension cord got too hot when I had the induction burner and the toaster oven on at the same time (baking and steaming vegetables). The only variable wattage appliances are the space heater and the induction burner. With my tiny trailer's system, the only two appliances I can really use at once are the oil heater on low and the Instapot, both adding up to 1,300 watts. I could use the toaster oven and induction burner if I were just simmering on a low temperature with the burner. I'd have to refer to the manual, though, to determine just what setting would deliver the lower wattage. The Instapot and mid-heat Duxtop would be okay. When camping, thinking about what is on the menu to be cooked has to include thinking and checking how much electricity I'll need to do the job. I have to plan sequencing my cooking. For instance, I can bake in the toaster oven, leave the food in the warm oven (now turned off), and then use the induction burner on a high setting to steam vegetables or boil pasta. In the mornings when heating tea water with the Cuisinart, we turn off the space heater for the few minutes it takes the induction teapot to boil water. Then after the teapot clicks off, we turn the heater back on. It's the camping dance of the electrons. One last possibility I use outside if it's not to windy is to use my 40-year-old Coleman propane gas stove--call it Old Reliable! I believe now I've established the parameters for electrical use with the Green Goddess. I'm a slow learner, but I do learn and haven't torched my rig. My son-in-law tells me to just use my equipment, and if a breaker pops, then I know what the limits of the system are. I get what he's saying but personally prefer to proceed using caution and math. I don't mind being branded as cautious. After all, I've been known to wear suspenders and a belt--the classic definition of a cautious man. "When you leave your campsite, make sure it's always cleaner than when you came." That's what my dad always told me when I was growing up. It made sense then (although I probably didn't admit it), and it makes sense now. The world needs to be less polluted, not more, and everybody should help make that happen. I've been thinking about what my dad said because there's been quite a bit of news about how the government shutdown has affected our national parks, which have furloughed employees due to lack of funds. I'm not going to add to the cacophony comments about the politics of the situation; rather, I'm going to focus on the topic of keeping camp clean. The National Geographic Society says in an online article that the damage to national parks and monuments from this shutdown will take years to overcome, that it's not just about picking up the trash. On Sunday, the Department of the Interior announced they would be dipping into funds collected from entrance fees to pay for trash clean up, restroom maintenance, and additional law enforcement. In a response to that announcement, the National Parks Conservation Association (NPCA) cited fears that using entrance fees would divert badly needed funds from the park service’s massive $11 billion maintenance backlog. Furloughing over 16,000 parks service employees and then diverting park collection fees to fund a minimal few employees may lessen some of the outrage of closing parks completely, but the true damage is low-level service now, falling even further behind in maintenance, and adverse effects on people and wildlife. The news is not all bad, though. Some individuals are volunteering to clean the parks. Most coverage is by local news, but Time magazine published an article about volunteers from various parks. Although admirable, timely, and necessary, the efforts of these fine individuals is superficial. Way to go, though. At least it's something. "Despite the shutdown most national parks grounds remain open. Visitors are entering without paying, and with no staff on hand, bathrooms are not being cleaned and trash cans are overflowing." The previous two national government shutdowns were for three days and then less than one day. The current shutdown has lasted so far for over two weeks. I thank all the volunteers who are helping keep our land as beautiful as possible. I intend to ask our government officials why our legislators can't manage to do the same. We need to take care of our messes, and so do the people we elect to office. Personally, I am inspired to be more environmentally friendly when I camp. It's just a shame, though, that I am inspired by such a negative example. This blog is based on tiny trailer camping, and camping small is a beginning for camping more ecologically--choosing less impact on the environment, not more. Bicycle camping produces even less negative impact, but I find I can't do that all the time. Let all tiny trailer campers, let all who seek a light footfall upon our lovely planet, let us all when we have the chance say a word that inspires and guides those who need it about protecting our planet more. After all, when we climb inside our tiny trailers, how well aware we are of the fragility of our environment. Just one or two thoughtless actions, and suddenly our little trailer resembles that junk closet at home where everything is shoved to get it out of sight. We certainly don't want that to happen to our beautiful parks, waterways, and monuments. That isn't what we want to see as we travel "that ribbon of highway." I've decided I enjoy writing tiny trailer profiles so much that I am going to dedicate a special blog page to list the profiles with a thumbnail portrait. That way interested readers can visit the page and see the profiles in an easy-to-choose format. If you're reading this via an email follow, go to the online blog (by clicking the linked title) and below the header you'll see the blog permanent page titles. Click on "Owner Profiles." For all the rest of you who are on this pace and linked to this particular article, of course, also click the page title "Owner Profiles." Since the formation of this blog, I've written one profile a month--five in total so far. I work to choose trailer owners from different age groups and geographic locations. I'm not doing great with differentiation, but I am doing okay. It's a matter of timing, and I'm getting better at it. Another bit of information regarding my blog is that on the sidebar on the right, below Popular Posts, is the "Labels" gadget. I place an identifying label to each blog post so that all posts on a subject can be called up to look at. The link also mentions how many articles are linked to that label, such as "Gearing up (4)." As more and more articles are written and posted, these organizational formats will help you find an area you are interested in. Thanks! When fall weather advances toward winter, I find more occasion to do camp chores inside my tiny trailer. Not all, though, because I'm also finding that my tolerance to cold weather is greater than I had assumed (especially if I dress for the cold!) Whether inside or out, what I have found is that the colder weather has focused my mind to act in a manner that keeps the camp organized. Here are some basic operational concepts that, when put into action, have helped me keep the chaos at bay while tiny trailer camping. Multiple uses My wife articulated this one, and I think it's fundamental common sense. The best means to utilized space well is to have less stuff. Therefore, if you can find a way to use one pillow or pot three ways, that's much more efficient use of space than bringing three pots or pillows. I'm not advocating, of course, hitting the road with only one pot and pillow, but perhaps it isn't necessary to have eight pots and pillows! Research thoroughly I try my best to research well and still find myself buying something and then discovering a different size or brand would have been better. It's part of the process, I guess. I'll provide two examples from our personal experience, one positive and one negative. The positive is choosing a heating source for the trailer for cold weather. I researched online but finally decided to try what we already had at home. My first heater was a small electric heater, which I found to be really noisy. The second choice was an oil heater, which we have found to be quiet and efficient. The heater also has three output settings, so we can choose to use the lower two (and mostly the lowest) to keep our wattage pull as low as possible. The negative example of research is our purchase of an ice cooler. Having researched, we decided to go with the Yeti brand, a 70-quart size. We have nothing negative to say about the ability of the Yeti to keep things cool; however, it is too heavy. My wife and I can manage it together, but she feels it would be more practicable to have two smaller coolers. I agree, especially when I am camping alone. I suppose a variation of the old carpenter's saying applies: Measure twice, cut once. Research thoroughly, buy once. I think this will be difficult to always be successful at, but it's a good idea to remember when standing in Cabela's and ogling all the equipment. A place for everything; everything in it's place We've found this to be true because every day we convert our bed into a table so my wife can have her mobile office. I've also found putting things away to be crucial in the cold and wet weather when I began cooking more inside. As an example, the other day I baked vegetables and feta cheese inside in the toaster oven. The process that worked best went something like this: Cut one vegetable and put it in the mixing bowl. Cut the second vegetable and put any extra away (and so forth). Mix the vegetables with Herbs de Provence and oil (having a paper towel on hand). Place vegetables in baking dish. Clean hands and take dirty dishes outside. Prepare feta and place in small dish for adding to veggies later. Clean the trailer and then get out the toaster oven. Bake. There just isn't room to leave vegetables and used dishes around inside the trailer, or to get the oven out early. Taking it once step at a time worked well, even though it took a little longer. Establish a camp routine This last point is more general but still applicable. Having good camp habits cuts down on the chaos. One day while cooking lunch outside, the wind was fiercely blowing. I had left the lid to the grocery box loose, and the wind swept it into a poison ivy patch. Putting unused items away and securing loose equipment is essential to maintaining camp order--at least for me. It takes time to establish a routine that works. It's a process, and we should make sure we enjoy the process. Nobody's paying us to camp; it's not our job, for crying out loud. Establish what's good for you, whether that you is singular or plural. Having a camp routine that utilizes the best equipment for you, and having efficient storage organization is really helpful, I think. Having said that, someone else could camp using methods the opposite as mine as still be happy as a clam. My most important rule is to be at peace with myself and my camping partner--and, if possible, to stay out of the poison ivy!